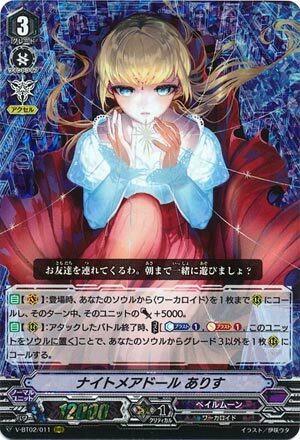 [AUTO](VC):When placed, call up to one from your soul to (RC), and that unit gets [Power]+5000 until end of turn. [AUTO](RC):At the end of the battle that it attacked, COST [Counter Blast (1) & Soul Blast (1) & put this unit into your soul], and call a card other than grade 3 from your soul to (RC). Good news: she doesn’t need to hit to proc shenanigans. Bad news: less shenanigans. Standard lacks a Purple Trapezist and only has Jumping Jill to make a new column, and every useis one less card in the soul and thus one less card for Pale Moon to play with. However, there’s bugger all else to run as a backup to Golden Beast Tamer and at least when you ride her you get SOMETHING aside from the Gift. Hurt by the lack of reliable ways to throw Jill in the soul apart from riding her but she’s workable until V-BT04.